Explore four visionary art environments created by female sculptors. Mary Nohl embellished her Lake Michigan property with a series of interconnected concrete curvilinear forms, some reaching the second floor windows of her family home. Truck driver and preacher Inez Marshal sculpted large blocks of limestone and established the International Sculpture Hall in rural Portis, Kansas. Grandma Prisbery's bottle village is located in an earthquake-prone area in Simi Valley, California. 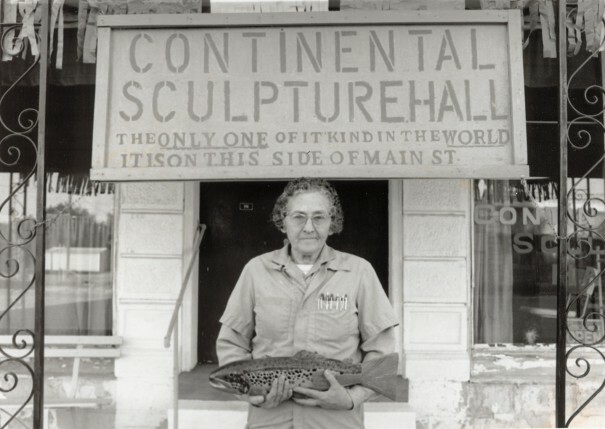 Laura Pope Forrester paid tribute to local and national heroes with her sculpted concrete vignettes surrounding her mercantile in rural Georgia. The presentation examines their inspirations and motivations, the work itself, and the afterlife of overlooked sites after their makers have passed.